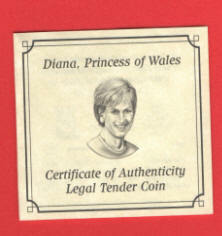 This limited mintage Princess Diana (Lady Di, Princess of Wales) legal tender Gold coin is from Niue and is packaged in the original capsule, with box and Certificate of Authenticity (COA) as shown in the picture. 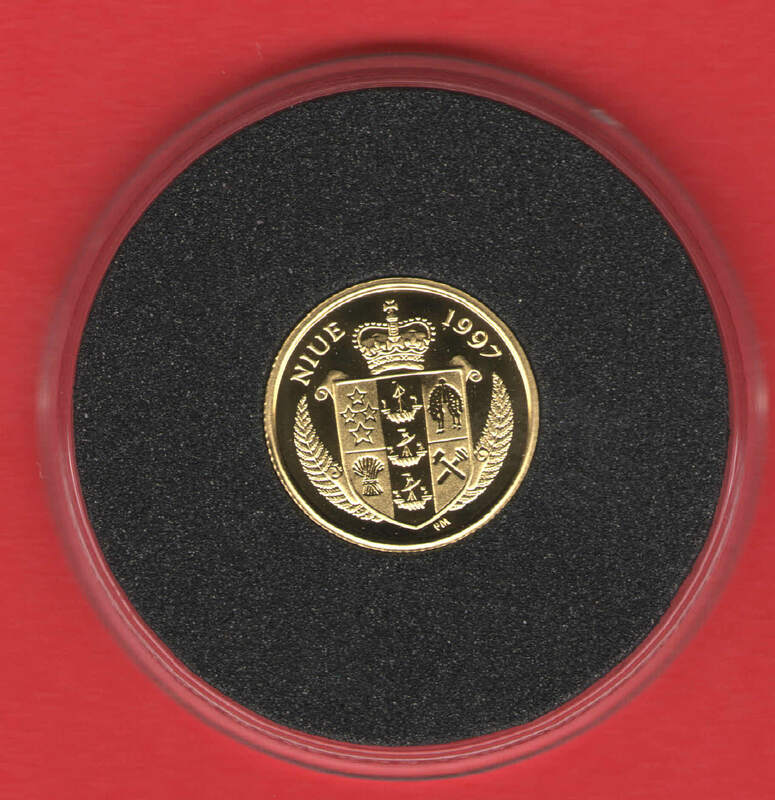 This small solid Gold coin was minted for the Niue Government in 1997 and is made of .9999 Fine ( = 99.99%) pure Gold. Contains a twentyfifth of an ounce of gold. Is in Mint issued proof condition and comes in the original Mint Red Leather-like box and includes the original Certificate of Authenticity (COA). 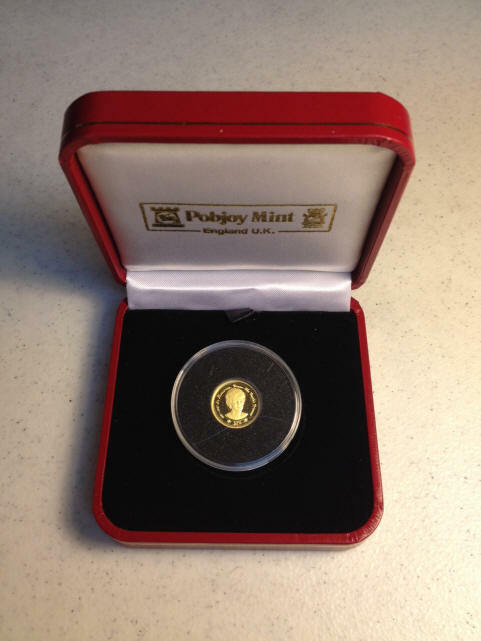 This limited mintage legal tender Gold coin from Niue is packaged in the original capsule, with box and Certificate of Issue (COA) as shown in the photos. This Gold coin was minted for the Nuie Government in 1997 and is made of .9999 Fine ( = 99.99%) pure solid Gold. Contains a twentyfifth of an ounce of gold. Is in Mint issued proof condition and comes in the original Mint Red Leather-like box and includes the original Certificate of Authenticity (COA). Please note that the coin is absolutely beautiful and untouched, in mint Proof condition along with the box and COA. However the plastic capsule that the coin is in has obvious wear and scuff marks on the outside, which has no affect on the beauty of the coin. 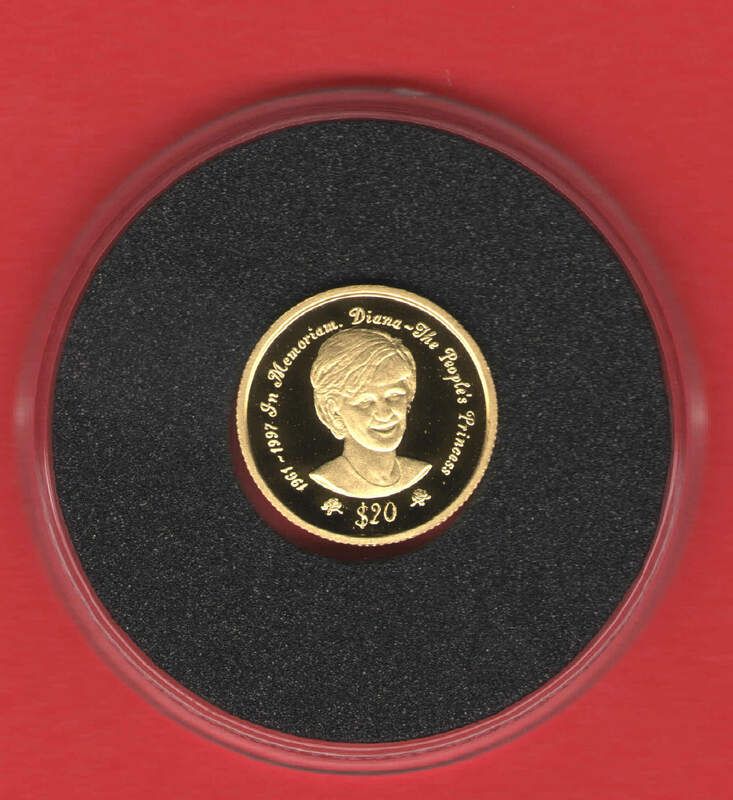 One side of this Gold coin features Diana, the Princess of Wales and the inscription "1961-1997 In Memoriam, Diana - The Peoples Princess" with the denomination of $20 below her portrait. The other side features a coat of arms with the inscription "Niue" and 1997 above it. Size of this $20.00 Face Value Gold Coin is smaller in diameter than a US dime. Limited mintage ......... Scarce! No more than 10,000 coins were produced ! Niue government coins are minted by the Pobjoy Mint, a United Kingdom Mint that produces coins for several countries that do not have their own minting facilities. Niue is an island country in the South Pacific Ocean, 1,500 mile northeast of New Zealand. Self-government was granted by the New Zealand parliament in 1974. Niueans are New Zealand citizens. Queen Elizabeth II is head of state in both Nuie and New Zealand. Our supply is very limited, so order soon. Please check out the pictures and let us know if you have any questions. Two other versions of Princess Diana gold coins were produced by the British country island of Niue. The difference is in Dianna's hair style. Each of those genuine gold coins has a limited edition mintage and contains exactly one tenth of an ounce of solid (24kt)gold. Both styles are shown below. They are $50 face value coins. Sorry, Out of Stock. No longer available. 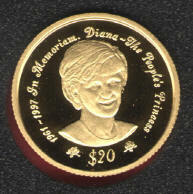 Shop for Princess Dianna gold and silver coins, collector supplies. 10,000+ happy customers. PayPal, money order, checks accepted.